You’ve heard the saying, “monkey see, monkey do.” Actually, if you have kids, then you’ve probably seen the saying in action. You talk on the phone, and your toddler is right there wanting to talk, too. If your child sees you enjoying a good book during your free time, then he is more likely to want to read, also. Make healthy food choices, and your son or daughter will grow up wanting fruits and vegetables just like you. And if your children see you taking care of your teeth, then they will learn to do the same. Drs. Nicholas D’Amico and Matt Mauck are the Denver family dentists who know that parents need to be active participants in their children’s lifelong pursuit of healthy and happy smiles. Parents should take advantage of the fact that children are born imitators. Therefore, make teeth brushing a family affair. If your children see you making oral health care a priority, then they will learn that this is important. And don’t forget to floss. As soon as your child has two teeth that touch, it’s time to start flossing. Brushing should begin as soon as that first little tooth appears. Use a baby toothbrush with a small head and just a tiny bit of toothpaste with fluoride. Don’t increase the amount until you’re certain that your child won’t swallow the toothpaste, but will spit it out instead. Ingesting too much fluoride can lead to a condition called fluorosis, which may cause white or brown spots on developing teeth. 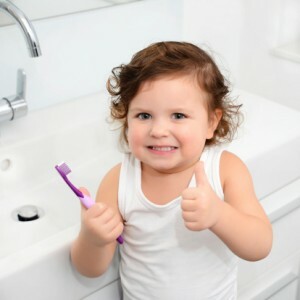 You’ll need to supervise your children’s oral hygiene routine until they are around seven or eight years old. Until then, they may need your help in order to adequately clean the molars at the back of their mouths. To help prevent cavities from developing on those hard to reach molars, which are also deeply grooved and pitted and therefore more susceptible to decay, Dr. D’Amico or Dr. Mauck may recommend dental sealants. These are clear plastic coatings that we “paint” on to the teeth and quickly dry with a curing light. When hardened to a clear finish, dental sealants are physical barriers between decay-causing bacteria and teeth. Fluoride treatments are another option for arming teeth for the fight against cavities. Applied topically as a gel or cream, fluoride has been shown to strengthen enamel, the outer layer that surrounds teeth and the first to be attacked by bacteria. To schedule a dental checkup for one of your children or anyone else in your family, contact the office of D’Amico & Mauck, the family dentist 80014 parents trust. Our practice proudly serves families from throughout Aurora, CO, and the surrounding areas, including Denver Tech Center, Centennial, Englewood, Denver, Parker, and beyond.